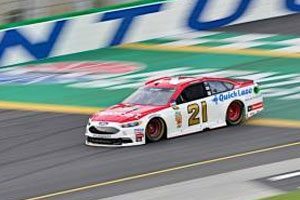 Ryan Blaney and the Motorcraft/Quick Lane team are hoping to capitalize this weekend on the speed they’ve shown in their past two trips to Kentucky Speedway. Blaney did not get to qualify in 2015. Because the Wood Brothers were at that point a part-time team without a provisional starting spot he didn’t race. Last year, qualifying was rained out again, but he did get to start and ran among the leaders before being collected in a crash on a mid-race restart. “I think our Cup cars have actually been really good [at Kentucky],” Blaney said on this week’s NASCAR teleconference. “We haven’t really got the great finishes that I feel like we should have gotten there, but I’m excited to get back. Blaney said he’s hoping a strong run at Kentucky will set the tone for the nine-race stretch run to the start of the 10-race playoffs. Blaney and the Motorcraft/Quick Lane team are positioned well for a spot in the playoffs due to their victory at Pocono Raceway last month, but relying solely on that win isn’t acceptable to Blaney and the team. “I don’t think we’re really doing anything different from what we have done all year even before we got the win,” he said. “You go out and you try to win stages and win races just like before and just do what we all have been doing all year. “I think we’ve done a pretty decent job at it. We’ve won a few stages and won a race. You’re just kind of trying to keep building your playoff status and trying to cushion everything from each round that just carries over. Qualifying at Kentucky is set for Friday evening at 6:15 p.m., and the 267-lap, 400-mile race is scheduled to start just after 7:30 p.m. on Saturday with TV coverage on NBCSN.